Earn $4.74 in Rewards credit (474 points) What's This? The SwissStop FlashPro Shimano Black Prince Carbon Brake Pads provide excellent stopping power specifically for carbon rims in all weather. Drawing on 70 years of experience in the rubber industry, SwissStop has created replacement brake pads featuring some of the most advanced compounds in cycling, with a meticulous production process and extensive research and development. It's no surprise that SwissStop pads have quickly become the only choice for pro riders and amateurs who demand the best. The FlashPro pad model fits Shimano 9/10, SRAM road, and TRP holders, and is available in several different rubber compounds. The Black Prince compound is specially formulated for high performance with carbon rims, providing excellent modulation on carbon brake tracks. It runs at a lower temperature than other compounds and wears more slowly. Sold in sets of four pads, enough to retrofit a complete bike, front and rear. Note: Black Prince brake pads are not designed for use with aluminum rims. I have been a fan of Swiss Stop brake pads for nearly a decade. I have used both the Race Pro version for alloy rims and the carbon version in several offerings. Currently I am using the Black Prince on most all of my bikes for carbon wheels. While the yellow race pro pads do appear to have somewhat better modulation the Black Prince are more durable and wear longer. The difference in modulation is minimal so I use these on my road bike(s) for training and racing since I have to change pads less frequently. I still prefer the yellow pads on my TT bike which sees fewer miles during the season. I bought the Zipp 404 Firecrest wheels in July 2016 and installed the included grey pads, giving me mediocre stopping power. I read good reviews about SwissStop pads and found out that Zipp approves of this brand, so I gave them a try and am much happier that my road bike stops better now. I will never go back to the grey Zipp pads, it is SwissStop pads only for me on Zipp carbon rims. Great stopping performance and quiet braking!!! I've had other carbon-specific brake pads on my rims, including ones made specifically for these rims. 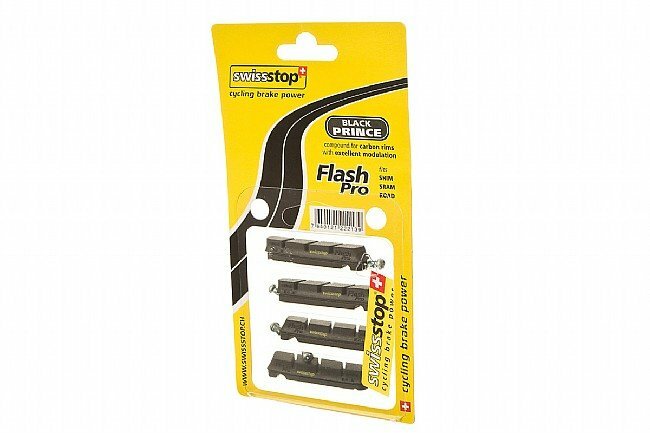 The Swissstop Flashpro pads outperform these pads, but are quieter as well! Love them! I use these for CX with 303 tubs that are a few years old. The are noticeably better than any other pad, save the new zipps grey version. I'd say 20% better than the old yellows and %50 better than the cork (remember those goddamn things?). Obviously, you need to switch pads when using al training wheels, but that is a 3 minute job and you have clean the bike after each cx race anyhow. I switched to the Black Prince pads from the Yellow King pads. The Black Prince pads seem to work much better than the Yellow Kings did. I get more confidence with the Black Prince pads and although they are still not as good as pads on Ali rims are they work well. I am pretty light so it may be harder for heavier riders, but so far so good. Great pads for your carbon wheels! My Easton carbon road wheels came with Swiss Stop yellow kings pads which worked pretty well but definately didn't come close to the breaking performance of aluminum wheels and rubber pads. I recently made the switch to these black prince pads and (WOW!) what a difference it made. The braking performance is awesome, pretty much on par with aluminum wheelsrubber pads and also they seem to be more quiet than the yellow king pads. I bought these to replace the Yellow SwissStop Brake Pads that came with my Wheel set. The Black Prince Carbon Pads have much better stopping power than the Yellow SwissStop Pads and after some downhill action at least to the touch, the wheels are not as hot. A good upgrade all around so don't hesitate to try them out. I replaced the SwissStop Yellow pads with the Black Prince pads and I really can tell a big difference in stopping power. I am using the new SwissStop Black Prince Carbon pads on my Easton EC90 Carbon Wheels and they have a very similar braking performance to that of my aluminum wheelset. I have great confidence in the stopping power of these pads and am very happy SwissStop improved on their yellow pads. I had used cork pads prior to purchasing the SwissStop pads and was very unhappy with my stopping power. The SwissStop Prince pads are great the difference is dramatic I highly recommend these brake pads. A little pricey but worth it. Was always skittish about going to carbon wheels (I was a VERY later adopter), but these pads are EXCELLENT. I was using the Yellow pads with my Vision Metron 40 full carbon wheels but they were quite loud and the stopping power wasn't great so I switched to the Black - much better performance and almost no squeaking. Great pads just wished they last longer. I ride Mt Diablo and various rides that go up and down, down and flats with stops where I use the brakes. I think I change pads at least once a year if not sooner which becomes pricey. I absolutely love the sound my brakes make when I hit them. The whir of Swiss stops on 303's is magical. In races of course it can be a bit disconcerting since the sound can be noticeable even with a touch of the brakes but they obviously do the trick. Nice pads. No problems at all. Carbon's not so great in the rain of course so be careful no matter what pads you have ripping alpine descents in the rain. Black Prince Carbon brake pads really do what they say they do. I have cork pads previously and was not impressed with the stopping power as they seemed to create a hard surface on the pads. The Black Prince stay soft and i even have to watch out as not to lock the tires up on quick stops. Good stuff! Works better than the Reynolds cryo blue I was using. Went from cork Zipp pads which were good to Carbon specific Swiss Stop (YELLOW) pads-really bad, poor stopping power and lots of squeal from them. Went to the (BLACK) Swiss Stops and they are 100% better - no complaints - will purchase again. I've ridden Black Princes on terrain with steep descents, in hot, dry, and wet conditions. I can't tell much difference from the Swiss Stop yellows or Reynolds blue pads, except that the Black Princes wear more quickly. My main reason for buying them is safety, specifically, Black Princes supposedly dissipate heat better so you're less likely to overheat and destroy your rims. Im willing to pay a little more for this safety feature even if the pads' braking action feels very ordinary. Switched the Yellow King pads for these (Black Prince) for my race wheels. There was a noticeable improvement in braking. Swiss Stop says that the Black Prince pads give the same stopping ability with carbon braking surfaces as their black pads do for alloy surfaces. This seems to be true based on my experience. I definitely like these more than the Yellow King pads. Use these brake pads with my carbon clinchers. They have worked very well in the dry and do not seem to cause a lot of heat build up in the brake track of the carbon wheels. I am not a great desender, so the heat build up is critical for me weighing 190 lbs. I have 25mm wide wheels so fitting them to the TRP brake carrier was a challange with Shimano 7800 brake calipers. Not enough room, so I mounted them without the angle adjustment washer. They are now fully seated to the brake track. This took about two training rides to get all four pads to set fully to the brake track. I have great stopping power as I can lift my rear wheel off the ground and cause a rear wheel lock up if I do not modulate the front brake.